Order your Lamy 2000 4 Color Ballpoint Pen today from FahrneysPens.com. Fine Pens, Refills & Luxurious Gifts – great prices & fast shipping. The 2000 4 Color Ballpoint Pen from Lamy still offers the style, comfort and performance that made it popular since its introduction in 1973. Because of its timeless design and appeal, almost every European collection of modern design includes the 2000. Formed from durable Makrolon, Gerd A. Müller created the 2000 with a large, rounded barrel and spring-loaded accents in brushed stainless steel. The 2000 is the embodiment of sheer elegant, form follows function design that will likely never become dated. The multi-color 2000 ballpoint pen is effortlessly activated with a one-handed push-button mechanism. You can easily see which color you have selected with the colour choice by view mechanism. It comes with black, blue, red and green color refills. 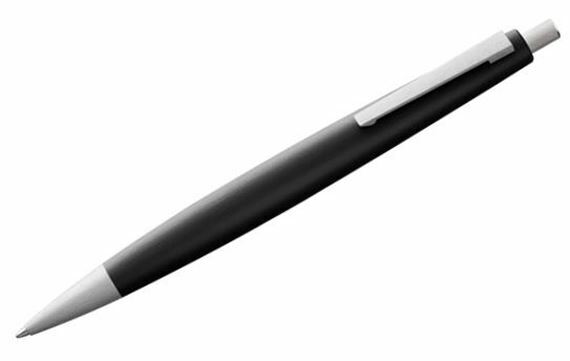 For an instrument that can take a workout, choose the Lamy 2000 4 color ballpoint pen. Pen Size and Weight: 5 1/2 x 1 5/8, 1 oz.